Back In Razors In A BIG Way - Check this one out! I may have left something out of the list (I'm sure there is a platinum scaled razor out there somewhere), but if you own a razor with any of these, you have something special. It is not surprising that razors were scaled in common materials. Razors were already expensive and how many men out there would pay a couple of hundred dollars in today's money to have their Mach 3 cast in sterling? For your consideration today, we have a fabulous, ornate Unger Bros. 5/8 Barbers Notched straight razor in elaborately crafted sterling silver scales. This piece is simply beautiful and incredibly rare. I can go a year without having the opportunity to buy a razor like this and many years without finding one with this degree of beauty and craftsmanship. Most of the sterling razors I have seen are fairly plain, but not many were made by companies like Unger Bros. The Unger Brothers had both a factory and sales facilities in Newark, NJ. The company advertised as manufacturing jewelers, silversmiths and glass cutters. The Unger family originated in Germany and came to live in Newark, NJ 1849. The elder son, Herman, started a jewelry business around 1871. 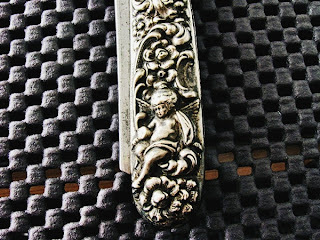 He began to make sterling silver items in 1878. Eventually, his four brothers joined the company. Sadly, by late 1879, only two of the five brothers were still alive. Herman and Eugene continued to operate the business - Herman, the chief silversmith and Eugene, the chief engraver. Both were officers of the company, which experienced its greatest financial success in the period from 1895 to 1907. In 1880 Eugene Unger married Emma Dickinson. Her brother, Philemon Dickinson, was hired by Unger, eventually becoming its primary artistic designer. Philemon designed an extensive line of beautiful repousse Art Nouveau pieces for which the company became renowned. It is very likely that this razor was personally designed by Philemon. Unger had incredibly high quality standards. When company staff judged molds and dies as being too worn to continue to be used, they were often sold to other companies which used them to make jewelry. The Unger hallmark was eradicated on these molds and dies. This piece has their hallmark, very small but very clear and is guaranteed authentic. 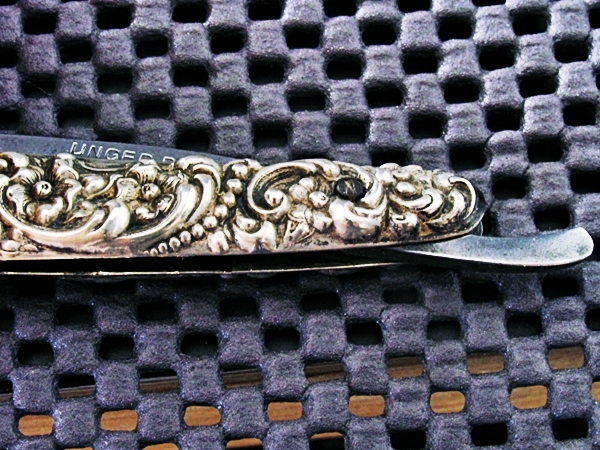 Unger Bros. was considered to be one of the premier makers of Art Nouveau sterling silver items in America. Their most popular lines were "dresser sets" adorned with amazing Art Nouveau designs incorporating cherubs, flowers, ocean waves and seashells. It is quite possible that this razor came from such a set. 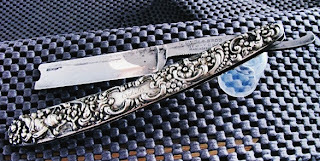 This razor is personalized in engraved script on one side with the initials "EJR." These scales are remarkably free of major damage. There are no holes, tears or corrosion spots. There is a slight inward bend to the back scale that does not interfere with operation or detract from the beauty of the piece. 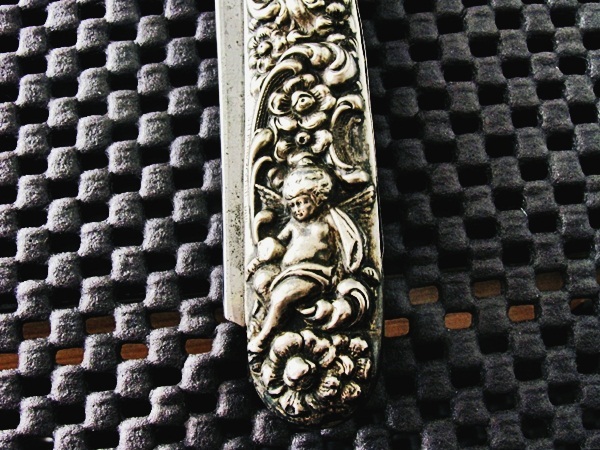 The hallmarks and "STERLING 925 FINE" are along the inside edge of the scale directly to the left of the head of the cherub. The scales are "single pin" style, with the top pin actually being a tiny flathead screw. While screws are almost always replacements, this one has the look of being original to the razor. Screws and nails were often used to attach new scales to older blade to replace broken scales. Since BOTH the scales and the blade are marked with Unger Bros. identification, this was clearly not the case here. Perhaps the designers felt that, given the possibility of damaging the delicate design with a hammer, a screw would be a better choice than a pin. There is no corrosion present on the razor, nor evidence of any prior major damage. There are just a few spots and a bit of "lather burn" that make up a minority of the blade's mirror finish. With all of that history, who cares how the razor shaves? Well, I do. And many of my clients love to shave with their rarest razors from time to time. I honed this razor up and found that it gives a fantastic shave. It has the barbers notch, which just adds to the interest. Exercise some care in closing the razor. 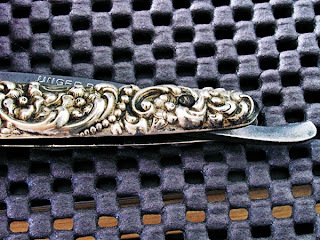 It is snug, but not as tight in the scales as would be a razor pinned with a more common and flexible material. Truly, this is one of the finest razors I have ever handled. Given its maker and scarcity, even a high price paid for this razor will make for an excellent investment. Been spending quite a lot of time trying to organize my inventory. Not surprisingly, since I have been in antiques for quite a long time, there are MANY things other than razors that I have. One thing I am doing that does not sound terribly exciting - but actually is - is creating a computerized inventory of every razor I have. "So what does that do for me?" you ask. That should be of GREAT interest to all of you specialists out there. Now if you are looking for a Wade & Butcher "cleaver" I can tell you how many I have that are shave-ready. 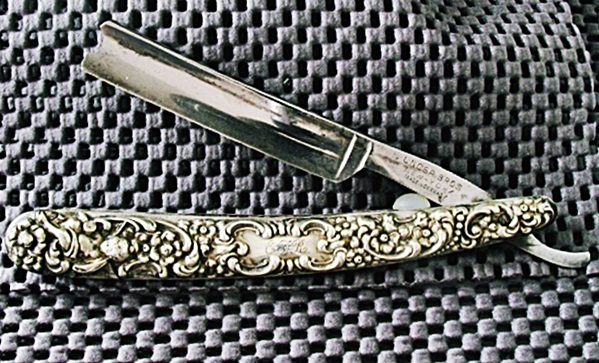 Do you hanker for razors with ivory scales? I will be able to find our how many I have and exactly what manufacturer made the blade in less than a minute. Considering that I have nearly 1,000 razors in stock, that is going to be a very interesting database. Since I do all of this work in the evenings, it will please me greatly to have my two daughters over the summer (part time) assisting me with this project. While they are somewhat less than enthusiastic about their "summer job," I believe it will teach them the value of hard work...well, I can dream, can't I? Sales of the diamond slurries and men's shaving products on the new website have been excellent (thank you all!) I am working on getting some razors on the site. In the spirit of my spring cleaning, you will find me disposing of some very nice items that are completely unrelated to shaving. Today I put up a killer collection of working vintage guitar effects pedals. You should check them out if you play, or if your kids do. Thanks again for your business and for reading my blog! NEWSFLASH! Our NEW Online Store Went Live Today! First of all, I wish to thank you for your past patronage of The Vintage Shaving Shoppe & Little Stropper brands. Your trust and confidence in our products and services has meant a great deal to all of us.
. This store will offer you more products than ever before - including those inexpensive, yet hard-to-find washroom and shaving items that most online stores don't carry. On the store homepage, you will find a link where you can sign up for our newsletter. Our current plan is to send these monthly, providing both shaving and collecting tips. We have been preparing a large number of shave-ready antique and vintage straight razors for sale. You will begin to see these on both eBay and on our new store in the next few weeks (we may email you to notify you when we have them listed). These will include Wade & Butcher, Case, Dubl Duck, Winchester, Clark & Hall, John Barber, Geo. Wostenholm and many others. As always, feel free to contact us with personal requests - we are constantly buying new razors and have over 1,000 currently in stock. Our new store provides shipping methods for our international clients as well as for our domestic customers. Now our friends across the globe will have access to nearly all of the products in the store! We recently added another product to our line of premium diamond honing sprays - a .125 Micron SPD spray. This is a great product for that ultimate "final finish." You can use this, or any of our other sprays on hard wool felt, leather or even balsa wood. Our sprays are also great for keeping your knives razor sharp. At up to 35% less than competitive products and with our ironclad satisfaction guarantee, you simply cannot go wrong with these products. Try one or more bottles TODAY! Thanks for making it to the bottom of this post and thank you once again for your business. We are here to serve you. If you have any questions or have products that you would like us to obtain for you, don't hesitate to contact me personally at jtischler@littlestropper.com. The Vintage Shaving Shoppe, LLC. Today's Haul! RARE Razors For you! Took a ride out to Adamstown today. Straight razors are getting harder to find every time I look for them. Even broken ones are getting scarce. So I didn't find a lot. But I did find some REALLY great stuff, which I hope to have pictures of soon. They include : TWO MINT Sheffield Ivory Handled "cleavers" in Original Case...RARE early Round Alloy Case Schick Injector....Wade & Butcher Fancy "Ready For Use Steel Set" Razor with worked spine...Geo. Wostenholm Doubly Carbonized Straight Razor Framed in BRASS - SUPER RARE!